Edition M, a new imprint for crime fiction, is the latest addition to Amazon Publishing in Germany. It launched with a star-studded party in Munich. Amazon Publishing continues to expand its footprint in Germany with the launch of a new crime fiction imprint called Edition M. This announcement comes just months after the German launch of its Montlake Romance imprint in March 2016. Edition M will focus on German-language crime titles, and Amazon Publishing will continue to sell English-language crime fiction from its American imprint, Thomas & Mercer, in Germany as well. Amazon Publishing launched in Germany in 2014, and the company has since released 130 titles in Germany so far. By the holiday season of 2016, Edition M plans to publish an additional 60 titles, by both debut and established crime writers. At the launch party for Edition M on July 5 in Munich, actor Richy Müller—who appears on the popular German crime show, Tatort—read from Hendrick Falkenberg’s latest book, Die Bühne des Sterbens (The Stage of Dying). 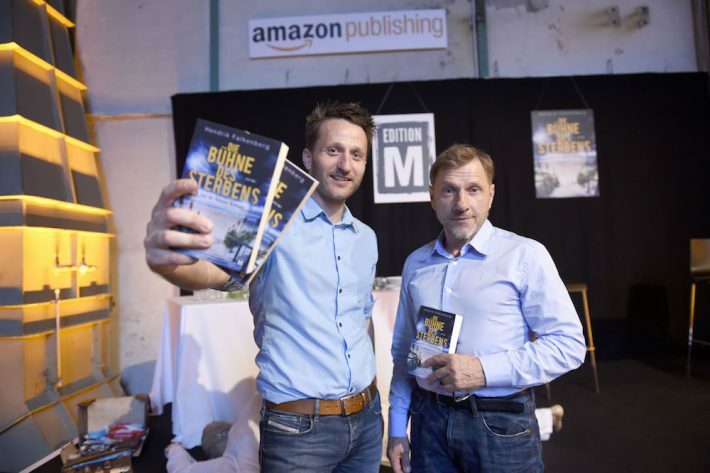 Falkenberg’s bestselling debut hit number one on the German Kindle list, and his first two books were translated into English by AmazonCrossing. Crime Pays in the UK: Could It Have to do With the Setting? Not to say that it’s something in the water, it’s often noticed by international observers that the two major publishing markets have different entertainment-genre priorities. The Americans love love. For the Brits, good literature is murder. Looking for the next big thing in crime novels? Look no farther—here are the top three German crime novels for 2016, as selected by the German Prize for Crime Fiction. Why is Scandinavian crime fiction ‘so concerned with societal themes and criticisms?’ Two leading authors in the genre explore the lucrative question. Ingrid Süßmann is an IT Project Manager at Droemer Knaur in Munich, Germany. She previously worked as Author Relations Manager for neobooks, and has held various positions at Random House Germany and Carlsen Verlag. In addition to her work in book publishing, Ingrid is also a certified beekeeper and fan of baby donkeys.